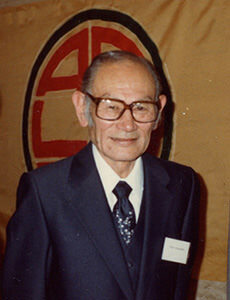 January 30th is the birthday of a true Asian American hero, Fred Korematsu. Since 2011, it’s been a designated holiday in California and a few other states. It doesn’t get you a day off. In fact, it’s a day that reminds you to fight. It’s a a day set aside specifically to remind us that when it comes to civil rights and individual liberties, America can never afford to take even one day off. It was a bit of karmic grace that the Monday after the most severe of the Trump administration’s executive orders to date–the travel ban against refugees and immigrants from seven Muslim-majority nations–all of us, not just Asian Americans, and partially thanks to Google, find ourselves recalling Korematsu’s birthday. As a young Californian in Oakland, Korematsu was the one who said no to the incarceration of Japanese Americans during World War II. He stood up, resisted, and paid the price in 1942. Are you beginning to hear history’s echoes? Critics have said the Court seemed unwilling to go against the government and President Roosevelt, although three justices dissented. To this day, that 1944 decision still stands. 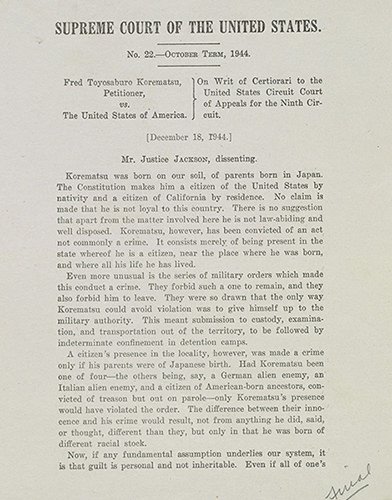 Korematsu lost his constitutional challenge and spent time in an internment camp. But he also found that not only was he shunned by general society and his country at war, he was also shunned by other Japanese Americans in camp who believed he should have shut up and cooperated. But vindication ultimately would come to Korematsu four decades later. In 1983, Prof. Peter Irons, a legal historian, discovered government memos that were withheld from the Supreme Court in 1944. The documents revealed an internal struggle within the government on how to present the case. Would it proceed with the Army’s contention that Japanese Americans were a threat to national security? Or would it also present information from the FBI and other military intelligence that contradicted the Army? Lies? You mean “alternate facts”? 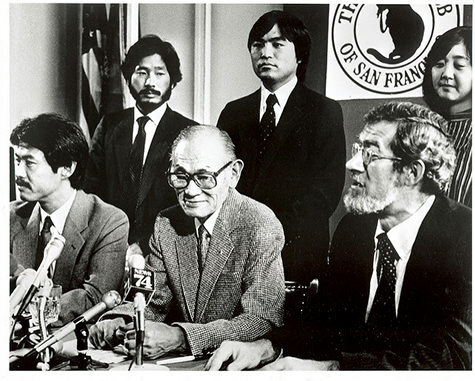 The discovery of the suppressed information enabled a group of attorneys, mostly young Japanese Americans, to reopen the case and overturn Korematsu’s conviction in 1983 in a federal district court in San Francisco. Because the government declined to appeal, the 1944 Supreme Court decision still stands. Korematsu’s legal team couldn’t directly challenge the high court’s opinion. When I talked to Minami a few years ago, it was during the Obama years. He told me it would be ignorant for anyone to use Korematsu as a precedent today for the wholesale imprisonment of people because of their race. What he didn’t imagine then was the possibility of Donald J. Trump as the 45th president of the United States. We must all remember Korematsu. Democracy requires our voices now. On Fox News, Rudy Giuliani admitted that Trump told him he wanted a Muslim ban and asked him how to do it legally. The hastily-drafted and semi-secretive executive order on the “travel ban” is a result of the Trump administration’s toxic twins, the Breitbarter Stephen Bannon and Stephen Miller. There is no specific mention of “Muslim,” but the executive order restricts nationals from seven Muslim-majority countries: Iraq, Iran, Yemen, Somalia, Sudan, Libya, and Syria. Maybe Trump doesn’t have plans for hotels there. None of the seven countries have yielded any people responsible for the most notorious terror attacks in America. Oddly, Saudi Arabia, Pakistan, Egypt, and the United Arab Emirates were left off the list. So we have a semi-partial, non-specific Muslim ban that’s just a little bit unconstitutional. But the order does come with Trump’s stated preference among “religious minorities” for the immigration of Christians over Muslims. Asian Americans know what it’s like to be singled out and banned from immigration. From the Chinese Exclusion Act of 1882, to the Japanese and the “Gentleman’s Agreement” in 1907, to the Filipinos in 1934 and the Tydings-McDuffie Act, Asians have been the target of America’s xenophobia. It wasn’t until President Johnson signed the Immigration and Nationality Act of 1965, when Congress banned racist country-specific quotas, that Asian immigration was able to flourish. If you forgot that, maybe you remembered this weekend when the echoes of history became a call to action. If you were protesting at airports or federal buildings across the nation, great. Ahmed Ali wishes he could have been with you. Because of the vague executive order and haphazard communications to those implementing it on the front lines, hundreds of people were detained for hours at American airports over the weekend. But Ali, 39, a Yemeni American who lives near me in California’s Central Valley, wasn’t at LAX or SFO. If Trump were waging a preemptive strike against the people he believes are so-called “bad Muslims,” the only ones affected by the executive order seem to be real innocents like Ali. He was stuck in Djibouti with his 12-year-old daughter at an airport. Officials blocked them from a scheduled Ethiopian Airlines flight that would take them back home to the U.S.
Ali, who has been an American since 2010, was trying to end a seven-year fight to secure a visa for his daughter. Ali, his w ife, and two other children are U.S. citizens. But the middle child was born in Yemen and has a Yemeni passport. The visa process has been hindered by the current civil war in Yemen. As an example of the “extreme vetting” that already exists, Ali’s daughter finally got her visa last Thursday. She then began her amazing journey with an uncle through war-torn Yemen to Jordan. Ali met his daughter and travelled to Djibouti to board their flight to the U.S., where they could be reunited in California with their family. And then Trump signed his executive order. “It’s kind of more racist and based on religion,” Ali told the Enterprise. Ali, who works as a convenience store manager, is now stuck abroad. The main breadwinner for his family, he can’t get back to work. And he can’t go back to Yemen. He is like all of us—waiting for the world to come to its senses. So on this day, let’s remember Ahmed Ali and Fred Korematsu. History’s echoes are loud and clear. It’s an urgent call to action as Trump and his xenophobes send America back in history to relearn a lesson Korematsu should have taught us already.